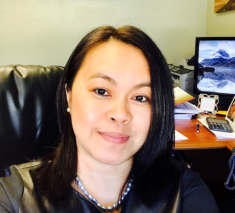 GINA SALES TE never has imagined that her genuine desire to serve others led her to seriously consider in-home care for the adults and the elderly. With her belief that genuine care comes from the heart and armed with her certifications as Certified Nursing Assistant in 2004, Residential Care Facility for Elderly as Administrator (RCFE) in 2005, and 12 years of her personal care giving experiences, she decided to boldly establish her own in-home care services business. Unstoppable to pursue her dream, she started everything in the right perspective, and in 2006, “DREAM HOME CARE” was born – a 100% woman-owned quality personalized in-home care business. However, believing that she needs more and further knowledge and expertise in the field of in- home care services, she enrolled in the Licensed Vocational Nurse (LVN) Program in 2008. To realize the challenge of providing only the BEST CARE to the clientele, CPP has recruited, trained and placed qualified, dedicated, committed and compassionate caregivers, wherever needed. With its mission to continuously provide quality service to clients, as well as to build a long-term relationship with its stakeholders, CPP strives to retrain and retool, upgrade and professionalize its in-home staff and caregivers for total client satisfaction.